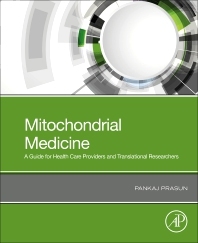 Mitochondrial Medicine: A Guide for Health Care Providers and Translational Researchers is an applied, holistic resource that addresses the evolving and multidisciplinary area of mitochondrial disease. The book discusses the fundamentals of mitochondrial medicine in humans, as well as the pathophysiology, diagnosis and treatment of mitochondrial diseases. Three all-inclusive sections examine the role of mitochondria in common medical conditions, such as diabetes, heart failure and the full range of inherited mitochondrial diseases. Sections cover the genetic and biochemical basis of both mitochondrial DNA deletion syndromes and point mutation syndromes, their clinical presentation, treatment plans, genetic counseling, prenatal testing, and ongoing research. While providing a solid foundation in its topic area, each chapter in the book is written in an accessible format with illustrative case studies, thus making it a quick bedside or clinical laboratory reference. Dr. Pankaj Prasun is an Assistant Professor of Genetics & Genomics, within the Department of Genetics and Genomic Sciences at the Icahn School of Medicine at Mount Sinai, New York, NY. Dr. Prasun is board certified by the American Boards of Pediatrics in clinical genetics and medical biochemical genetics. He has a special interest in mitochondrial disorders and runs a mitochondrial clinic at the Icahn School of Medicine. He has more than 15 publications as first author and is editor-in-chief of the Journal of Paediatric Genetics.